While you may be familiar with the ingredients, flavors, and textures found at your favorite Indian restaurant, it’s likely that they only scratch the surface when it comes to the variety of diverse dishes that can be found in India and throughout the country’s vast diaspora. It’s unknown to many that India’s cuisine is as regionally diverse as Italian, with contradictions as dramatic as the heavy use of dairy and cheese in one region, to the eschewing of dairy all together in another. Clay (or modern stainless steel) tandoor ovens add depth, flavor, and char to breads and meats throughout the Punjab region in the north of India, while an everyday meal in the southern-most region of Kerala consists mainly of seafood curries. While the dishes below are often favorite go-to’s when it comes to Indian food, these dishes are from geographically different places touched by a diversity of people who have truly made them what they are. Let’s take a closer look at where and how they came to be. Next time you’re cooking (or ordering) Indian food, you’ll be that much savvier about exactly what it is that makes each dish unique. Naan is believed to have come to India with the Persians and the Mughals, and this would make a lot of sense as variations of this leavened, oven-baked flatbread are found from Iran to Pakistan, Azerbaijan to Eastern China. Characterized by its chew and char, naan is cooked in a tandoor oven— another distinguisher from other similar flatbreads such as Malaysian roti canai. Brushed with clarified butter or ghee after baking, and sometimes sprinkled with nigella seeds, cumin, or even rose essence, naan is considered an essential, elemental part of meals throughout the Middle East, Central and South Asia. Warped with pockets of air that bubble up and char, the textures of naan range from crunchy to soft, chewy to fluffy. Try these naan recipes at home, and you’ll find that even without a tandoor oven, you can get a similar textural experience and make the most of your favorite curries. The Punjab region lies in northern India and shares its western border with Pakistan. It is a culturally and geographically diverse region, as is demonstrated in its cuisine. Known for its traditional tandoor cooking, it’s better known for its heavy use of dairy—which makes sense as it’s a high dairy-producing region. Palak paneer makes good use of plentiful fresh cheese, which is what “paneer” means in Urdu, the national language of Pakistan. Combining “palak", Urdu for fresh spinach, and paneer makes for a rich side or hearty vegetarian main. Armed with a green color and matching earthy, vegetal taste—vegetarian or not, this dish is sure to satisfy. 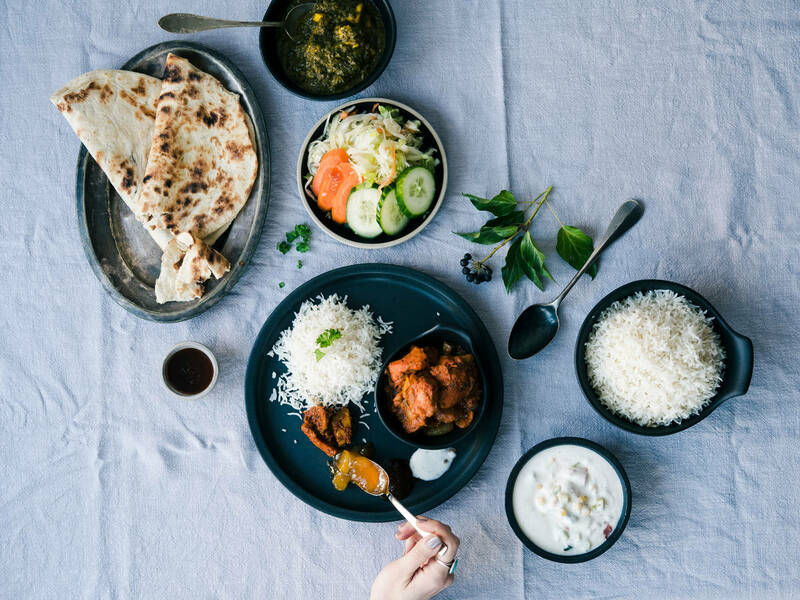 Indian cuisine has melded with a number of others over the years, as a result of colonialism, but no blending has been more distinct (and delicious) than that of with the UK. Tikka is another method of Punjabi preparation that marinates chicken in a spiced yogurt and cooks it in a tandoor oven until nearly blackened on the outside, with an extremely tender inside. An extremely popular dish in the UK, it has been remixed over the years to better suit the British palate, taking on the form of chicken tikka masala. This dish takes the essential tikka chicken and layers on a creamy, orange tomato sauce, usually spiced with garlic, coriander, cumin, and garam masala. Such pride the UK had for this new rendition of the classically Indian dish, that a motion was made in the British House of Commons to protect chicken tikka masala with an EU Protected Designation of Origin status in 2011. It was not granted, however it remains Britain’s most popular curry. Also eaten in sandwich form, the question is: is chicken tikka masala an Indian dish or a British one? Either way, it’s delicious. Coconut and coconut milk are characteristic of the cuisine of India’s tropical southern regions. Grown and readily available in the lush and hot coast of Goa, the use of coconut, an abundance of seafood, tropical fruits, and chillis, are the most notable aspects of this region’s cuisine. The whole coconut, including the grated meat, milk, and water, finds its way into many dishes. Influenced by previous Portuguese and Mughal invasions, combined with the more recent influx of Hindus to the population, the complexity and diversity of the food served in this region is only continuing to grow. Try this coconut curry at home for a taste of southern India—sweet and creamy from the coconut, yet savory and well-spiced.